Forget about ecards, emails, tweets, Facebook postings, Instagram and all the other ways we now use social media to communicate with and to share our lives. While those communications tools have their value, they’ve become so insidious that we’ve become a text-happy world that has relegated an intimate, thoughtful message to the round file. We fire off quick emails often without much thought, some of which we regret almost as soon as we push send. Is it any wonder that we have spam filters on our email when we are inundated with a barrage of emails not only from those we want to hear from, but also from complete strangers and organizations that want something from us. Stop it already! Handwriting is a skill and courtesy that was once drilled into us by our parents and educational institutions. We were taught how to write in cursive and good penmanship was highly valued (Sadly, cursive is no longer taught in our schools).Be sure to send Aunt Sarah a nice note for the birthday gift, your mother might have said. 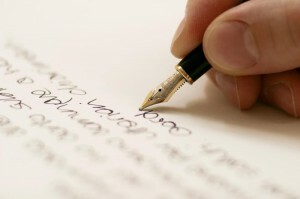 And in business it was once common courtesy to send a handwritten note after an interview or when you gained business or any other business situation that called for an intimate and thoughtful response that strengthened the connection. But that is quickly falling by the wayside and to our detriment. Even though we think we’ve “communicated” with all the tools on our keyboard, it seems that all we’ve done is create yet another email thread that doesn’t really express a human connection and probably gets deleted or misunderstood. Too often, the only time we actually send a handwritten note is when we add a little missive when we sign a card we’ve purchased for that “Hallmark Moment”. According to the American Greetings Card Association, we send 6.5 billion cards per year with the most popular being for birthday and then Christmas and Valentine. It shouldn’t be a surprise to note that women send 80% of all cards and spend more time choosing a card than men. There are many note-worthy moments in our everyday lives that go unacknowledged. Just look around you. Perhaps a co-worker has been having a difficult go at home or at work and could use a quick and thoughtful note placed on her desk before she comes in to work, or maybe your significant other has simply been the best ever and a loving message could propel that into some special magic later on, or a neighbor has been especially kind and helpful or maybe there has been a lot of water under that proverbial bridge with a family member and sharing some intimate thoughts that can enrich or rekindle your relationship. The opportunities are endless and give us pause to reflect upon those in our life who are a part of us in many ways and are yearning for our touch. So pick up the pen, there’s someone waiting to hear just from you. To schedule an appointment with Ben Novell, LMFT, Janelle Novell, LMFT,RPT-S or any of our therapists, please call 951-252-9911.